The realisation of an urban design involves many players, such as designers, critics, politicians, journalists, public relations specialists and residents. In order to consult with each other they make use of drawings, but also frequently of words, to be able to interpret the drawn objects in the plans. But are these urbanistic notions used by everyone in the same way? And have there been noticeable changes in their usage or meaning over time? This urbanistic and linguistic doctoral research addresses these questions. The problem statement is as follows. Both during the design and realisation phases of urbanistic plans and during the present-day study of plans from the past, it turns out that the most important urbanistic notions – words that refer to the drawn objects – are not used uniformly (with the same meaning) by the designers, the other actors and contemporary researchers. This lack of clarity on terminology is a hindrance to good planning, design interpretation, communication and project realisation. It is therefore necessary to find out which actors are using which words (linguistic signs) and with which meaning, how these relate to the drawings (visual signs) and ultimately to the reality (built objects), and what changes have taken place since the initial planning phase. 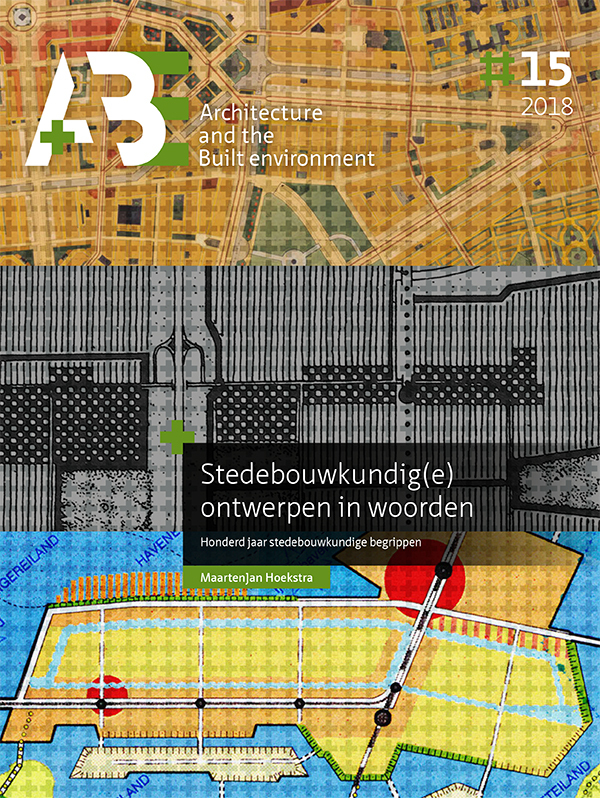 To define the scope of the research, words have been selected that refer to concrete, physical design phenomena in three so-called semantic fields: the structure of the city plan (for example, stad [city] and buurt [neighbourhood]), types of public spaces (for example, straat [street] and park [park]) and types of buildings (for example, huis [house] and winkel [shop]). As a further restriction, the use of such words has been investigated in texts written by five types of actors: designers, colleagues, politicians, journalists and (if present) public relations specialists. In order to connect the research to design practice, case studies were carried out on three comparable designs (extension plans) for the city of Amsterdam, each representing a different social context: Plan Zuid (1900-1917), Bijlmermeer (1962-1968) and IJburg (1995-2003). Using theories from semiotics (the ‘study of signs’) a conceptual model is presented which can be used to describe urban design notions. This model is shaped like a rhombus, with the linguistic sign (word) on the left and the visual sign (drawn object) on the right. The meaning is given at the top and the (built) object in reality is at the bottom. The latter is not of particular importance in this study, however the meaning is all the more important: this can be further divided into the physical abstraction on the one hand and the subjective concept on the other. This last component in particular can differ among various actors, for instance due to the actor’s motive and the frame of associations that the word evokes. The method used for the case study comprises four steps per semantic field (and within this per drawn object). Starting from a designed drawn object, it is first investigated which words were used by the designer(s) and with which meanings. This enables insight into the ‘articulate and convince’ mechanism used by the designers, and in many cases the combination of word and drawing provides additional insights into the plans (sub-question 1). Then it is examined to what extent contemporaries – colleagues, politicians, journalists and public relations specialists – applied their own ‘articulate and convince’ mechanism to the drawn object, by ‘accepting or rejecting’ the words used by the designer(s). This gives insight into differences in word use as well as strategic motives (sub-question 2). Finally, the development of the words to date is researched, using historical and etymological dictionaries, and the realisation of the drawn objects is considered. This provides insights into the relationship between object, word and meaning in both the planning period (synchronic, at the same point in time) and in the development between then and now (diachronic, through time); patterns are evident in both cases (sub-question 3). Based on the designers’ use of words (sub-question 1) it can be determined that plan explanations written by the designers (the written language) in all three cases display similarities with their plan drawings (the ‘drawn language’) in terms of structure, focus, detail and progressiveness; while the combination of text and image in particular tells the full story. The designers use different motives to convince other actors, especially in a functional, technocratic or figurative way. Studying the plan explanations also produced many additional insights into the designs, compared with simply analysing the plan drawings. In Berlage’s Plan Zuid, the development of a collective society was central, with ‘worker palaces’ surrounded by monumental, leafy avenues. Based on his ‘Explanatory Memorandum’ and his original plan drawing – which strikingly was not made public due to the amount of detail – Berlage’s written language and his visual language can best be described as precise, functional and comprehensive, and includes a kind of ‘rules for visual quality’ in terms of blokbouw [block construction] and bijzondere bebouwing [special buildings]. The design focused on monumental public spaces, which were drawn in great detail in a geometric network of long lines on four hierarchical levels. The design for the Bijlmermeer was aimed at creating a kind of ‘super collective’: a socially-engineered society made up of identical residents, for which a single ideal home and residential area would suffice, with 90% high-rise buildings in green areas. Nassuth’s and his team’s use of words and drawings can be characterised as abstract, technocratic and sometimes even hermetic (not focused on communicating). The employees of the Urban Development Department drafted their design as though it was a construction drawing for a machine, with strictly separated flows and planes. The plan explanations also read more like technical manuals, including incomprehensible abbreviations, such as I.C.G. (inrichting voor het collectieve gebruik [arrangement for collective use]). In the design for IJburg an attempt was made to strike a balance between diversity and regularity. The written and drawn language of the initial phase of the plan demonstrate how expressive, symbolic and metaphorical it is. Because IJburg was to be constructed on the open IJmeer, the initial plan drawings and explanations had to win over opponents of the project. It is no coincidence that almost all drawings in the ‘Memorandum of Starting Points’ were sketches and the most important drawing - Palmboom’s bird’s eye view - only used the symbolic ‘natural colours’ of blue and green; as if the development of IJburg would make the IJmeer more natural. Metaphorical concepts such as groene tunnel [green tunnel] (in reality neither green nor a tunnel), vizier [visor] (in the sense of ‘openness’), onderwaterlandschap [underwater landscape] and eilandenstad [island city], and positive archetypes such as boulevard, stadsstraat [city street] and laan [avenue], fitted in well with this almost manipulative use of visual language. As far as the use of words by the other actors, their motives and mutual communication is concerned (sub-question 2), it turns out that contemporaries may be attributing alternative meanings to the words that they are copying from the designers, and that they can use alternative words when they reject the ones of the designers. In doing so, colleagues in particular use negative and neutral alternatives to distance themselves, politicians do use the designer’s words but they also sometimes use more concrete alternatives, journalists use well-known but neutral alternatives instead of jargon, and public relations specialists use both the designer’s words and sometimes even jargon. For the relationships between the object, word and meaning (sub-question 3) four synchronic patterns were found (unambiguity, synonymy or variations, polysemy (multiple meanings), and overlap), and four diachronic patterns (continuity, new words, outdated words, and changes of meaning). In historical research urbanistic notions must therefore be seen in their historical context, because they can change in various ways, sometimes even unnoticed, easily resulting in possible misinterpretation. This research has produced various general implications. On a linguistic level it can be said that, among other things, urbanistic linguistic and visual signs refer to a meaning in the head of the person who uses them, just like other signs, but because they also refer to a future object that does not yet exist in reality, the creation process of both types of signs is complicated. In an urbanistic sense, changes within a few pairs of concepts are particularly notable, such as stad [city] and land [country], buurt [neighbourhood] and wijk [district], straat [street] and weg [road], and huis [house] and woning [dwelling]. The research reveals a number of general shifts, such as those between government and market, between urbanistic and architectural design, between urbanism and other fields, and in the role of language and communication. Above all it demonstrates that there is a close relationship between drawing and language, and hopefully, thanks to this research, that relationship has become a little clearer for all actors involved.